1.1 “McLeod” shall mean McLeod Cranes Ltd, or McLeod Hiabs Ltd as the context requires, or any agents or employees thereof. 1.2 “Customer” shall mean the customer, any person acting on behalf of and with the authority of the customer, or any person purchasing equipment and services from McLeod. 1.3 “Equipment and Services” shall mean all equipment and services, materials or advice provided by McLeod to the Customer including without limitation the hireage of cranes (with or without operators), carriage of goods, transport, transporters, precast concrete, labour hire, other equipment hire and associated services and all charges for labour and work, hire charges, insurance charges, or any fee or charge associated with the supply of equipment and services by McLeod to the Customer. 1.4 “Price” shall mean the cost of the equipment and services as agreed between McLeod and the Customer subject to clause 4 of this contract. 1.5 “Site” shall mean the place or area where the Equipment and Services is to be used for the purposes of this contract. 1.6 “Crane” shall mean crane as defined in the Pressure Equipment, Cranes and Passenger Ropeway Regulations 1999. 2.1 Any instructions received by McLeod from the Customer for the supply of equipment and services including equipment and services that McLeod have ordered or are required to order from overseas shall constitute a binding contract and acceptance of the terms and conditions contained in these Terms and Conditions of Trade. 3.1 The Customer authorises McLeod to collect, retain and use any information about the Customer, or for the purpose of assessing the Customer’s credit worthiness, enforcing any rights under this contract, or marketing any equipment and services provided by McLeod to any other party. 3.2 The Customer authorises McLeod to disclose any information obtained to any person for the purposes set out in clause 3.1. 4.1 Where no price is stated in writing or agreed to orally the equipment and services shall be deemed to be sold at the current amount as such equipment and services are sold by McLeod at the time of the contract. 4.2 The price may be increased by the amount of any reasonable increase in the cost of supply of the equipment and services that is beyond the control of McLeod between the date of the contract and delivery of the equipment and services. 4.3 McLeod may require the payment of a deposit, the sum of which will be determined by McLeod in its sole discretion. 4.4 McLeod reserves the right to revise its rates of hire and related charges without notice. 5.2 Unless otherwise agreed all equipment and services must be paid in full on the 20th of the Month. 5.3 Interest may be charged on any amount owing after the due date at the rate of 6% per month or part month. 5.4 Any expenses, disbursements and legal costs incurred by McLeod in the enforcement of any rights contained in this contract shall be paid by the Customer, including any reasonable solicitor’s fees or debt collection agency fees. 5.6 A deposit may be required before the provision of equipment and services. 6.1.2 The quotation shall be exclusive of Goods and Services Tax unless specifically stated to the contrary. 6.2 Where equipment and services are required in addition to the quotation the Customer agrees to pay for the additional cost of such equipment and services. 6.3 Any quoted prices may be subject to certain requirements provided by McLeod to the Customer which are to be read in addition to these terms and conditions of trade. Only written quotations are binding on McLeod. 7.1 No claim relating to equipment and services will be considered unless made within seven (7) days of delivery or where appropriate supply and or erection. 7.2 In the event of any dispute or difference arising between the parties in respect of any matter concerning these Terms and Conditions, the parties shall in good faith in the first instance use their best endeavours to resolve the matter themselves. 7.3 In the event that the parties are not able to resolve the matter themselves, the parties may agree upon a formal mediation to be conducted by a mediator acceptable to both parties. 7.4 The Customer and McLeod shall bear the costs of the mediator equally. 7.5 In the event that: (a) the parties do not agree upon the appointment of a mediator within a reasonable period; or (b) the parties are unable to resolve the dispute by mediation, the dispute shall be referred to arbitration under and in accordance with the Arbitration Act 1996. 8.1 No oral agreement, promise, collateral stipulation, representation, condition or warranty given or entered into by McLeod or by McLeod and not in conformity with the McLeod Terms and Conditions of Trade shall be binding upon McLeod unless confirmed in writing by McLeod. 9.1 The Consumer Guarantees Act 1993, the Commerce Act 1986, the Fair Trading Act 1986, Carriage of Goods Act 1979 and other statutes may imply warranties or conditions or impose obligations upon McLeod which cannot by law (or which can only to a limited extent by law) be excluded or modified. In respect of any such implied warranties, conditions or terms imposed on McLeod, McLeod liability shall, where it is allowed, be excluded or if not able to be excluded only apply to the minimum extent required by the relevant statute. 9.2.2 The Customer shall indemnify McLeod against all claims and loss of any kind whatsoever however caused or arising (and without limiting the generality of the foregoing of this clause whether caused or arising as a result of the negligence of McLeod or otherwise), brought by any person in connection with any matter, act, omission, or error by McLeod its agents or employees in connection with the equipment and services. 9.3 McLeod will not be liable for any loss or damage of any kind whatsoever arising from equipment hired not arriving on time or from deficiencies in the performance or reliability of equipment hired. 9.4 Unless otherwise agreed in writing, all contracts of carriage shall be "at limited carriers risk" pursuant to the Carriage of Goods Act 1979. 9.5 Unless otherwise agreed in writing, for all contracts of carriage McLeod will not be insuring the goods. Insurance of the goods is the sole responsibility of the Customer and all goods shall be deemed to have been delivered when they are physically delivered to the delivery address specified on the consignment note. 9.6 No party shall have any claim against McLeod nor shall McLeod be liable for any matter arising from or relating to these Terms and Conditions generally. 10.1 McLeod Standard Operating Procedures sets out certain responsibilities relating to the health and safety responsibilities of the Customer. 10.2 These responsibilities are to be read together with and form part of this contract. McLeod will supply its standard selection of slings and lifting equipment but accepts no responsibility for loss or delay if these are found to be unsuitable for the purpose required. All slings and ancillary equipment shall be used by the customer at the sole risk of the customer. 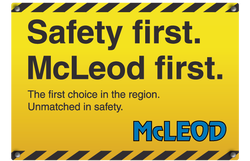 McLeod does not accept responsibility for the correct use of slings or lifting equipment or for the method of slinging. If any slings or lifting equipment belonging to McLeod is destroyed or damaged, the customer shall pay to McLeod the cost of replacement or repair (as the case may be) resulting from that destruction or damage. (iii) that clearance of 4 metres is afforded in respect of all overhead wires and that footpaths, kerbs and channels are suitably planked. (b) Should the crane or transporter need to be towed into or out of the site, the cost shall be additional to the rate quoted and will be to the Customer’s account. (a) The crane operator shall be under the direction and control of the Customer and shall for all purposes of this contract be regarded as the servant or agent of the Customer. The Customer alone shall be responsible for all claims arising in connection with the operation of the crane by the operator. (c) McLeod reserves the right to provide a supervisor to the site if McLeod in its sole discretion considers it necessary. If McLeod does so the charges payable by the Customer shall be increased accordingly. (d) The Customer warrants that the weight of the object or objects to be lifted in any one lift and the radius of the proposed lift (measured from the radial point of the crane) will not be exceeded at any time. Where the weight is getting close to the maximum lifting capacity of the crane, as stated by the Crane’s safe load indicator, the McLeod operator or supervisor has absolute discretion whether to complete the lift as planned or use a safer alternative. A larger capacity machine may be required and that will be at a cost agreed before completion of the lift. (e) Where the Customer has understated the weight or dimensions of the goods to be lifted by the crane and McLeod has relied on the weight, dimensions or working radius stated, the Customer shall be responsible for all extra cost and risk incurred by McLeod by reason of McLeod reliance upon such stated weight, dimensions or working radius. (f) The Customer shall be responsible for all loss or damage whatsoever caused while the crane is entering, leaving or on the Site, including the cost of repairs suffered or incurred by McLeod in consequence of any breakdown or damage to the crane where such breakdown or damage is caused by any negligent act or omission or misdirection of misuse of the crane on the part of the Customer or the Customer’s servants, agents, contractors or subcontractors and in particular shall be responsible for the payment of hire at the appropriate negotiated rate during the period the crane is necessarily idle as a result of any such negligent act or omission or misdirection or misuse of the crane. McLeod accepts no responsibility for loss or damage to goods being handled by the crane or damaged by the crane however caused during the period of the hire except for loss or damage arising out of any negligent act or default of McLeod. The Customer is responsible for providing legal, clear and unrestricted access to the Site and ensuring that the access and Site are adequate to support the Crane, transporter and or vehicles. The Customer shall be solely responsible for all damage which may be caused to underground and overhead services, footpaths, driveways, grounds, lawns, fences, structures, cranes, transporters and or vehicles or any other property caused by the vehicles whilst entering or leaving Site, or manoeuvring whether on or off Site or otherwise. McLeod shall not be responsible for any loss or damage arising out of any stoppage or delay occasioned by a cause beyond McLeod control including but not limited to weather conditions, ground conditions, strikes and industrial disputes. It is the Customers responsibility to ensure the security of the Crane, Transporters or Equipment whilst the Crane, Transporters or equipment is on Site. The Customer shall be responsible for all losses or damage whatsoever caused while the Crane, Transporters or Equipment is left on the Site, including the cost of repairing damage suffered or incurred by McLeod as a consequence of any damage caused by any act- or omission on the part of the Customer or the Customer’s servants, agents, contractors, sub-contractors or members of the public and in particular shall be responsible for the payment of hire at the appropriate Price during the period the Crane, Transporter or Equipment is idle as a result of any such act or omission. The period of hire shall be calculated on a depot to depot basis and shall therefore be the elapsed time in any day from the time of the delivery of the Crane, Transporter or Equipment to the Customer at McLeod depot to the time of re-delivery of the Crane, Transporter or Equipment by the Customer to McLeod depot on that or any other day. Hire shall be charged accordingly and may include a minimum of one hour of elapsed time on site. McLeod may opt for a Km rate on a depot to depot basis rather than a time rate. Where transport of additional jib sections and Crane equipment is required, the cost of it will be additional to the hire rates quoted and will be to the Customer’s account, together with the cost of rigging and de-rigging. Additional charges will be payable by the Customer in accordance with McLeod current hire price list for all work performed outside normal working hours and on Saturdays, Sundays or public holidays. A minimum charge of four hours for the operator applies to work carried out on Saturdays, Sundays or call back on Saturdays/Sundays. A minimum charge of eight hours for the operator applies to work carried out on public holidays or call back on public holidays. Where site allowances are payable, there will be an additional charge to the Customer. Where the site is at a distance from the depot so that overnight accommodation for the operator and any other accompanying personnel is necessary, the cost of the accommodation and meals will be to the Customer’s account. 12.1 The guarantees contained in the Consumer Guarantees Act 1993 are excluded where the Customer acquires equipment and services from McLeod for the purposes of a business in terms of section 2 and 43 of that Act. 13.1 If the Customer is a company or trust, the director(s) or trustee(s), in consideration for McLeod agreeing to supply equipment and services and grant credit to the Customer, also accept this contract in their personal capacity and jointly and severally personally guarantee and undertake to McLeod the payment of any and all other monies now or hereafter owed by the Customer to McLeod. Any personal guarantee made by any party shall not exclude the Customer in any way whatsoever from the liabilities and obligations contained in this contract. The guarantors and Customer shall be jointly and severally liable under the terms and conditions of this contract. 14.1.6 the Customer, if it is a person, becomes bankrupt or dies. 14.2 Any such termination shall be without prejudice to the rights of McLeod in respect of any breach of these Terms and Conditions. 15.1.3 to the fullest extent permitted by law, the Customer waives any rights it may have now or in the future to receive a copy of any verification statement or other confirmation related to any security interest created or provided for by, or perfected in the manner contemplated by these Terms and Conditions. 15.2 In addition to the security interest referred to in clause 15.1.1, the Customer also grants a security interest in all present and after acquired Equipment as security for all moneys now and in the future owing by the Customer to McLeod. 16.1 Subject to clause 9.5, McLeod may, at its own expense, arrange and maintain such insurance as it, in its discretion, considers is required in respect of any Equipment and Service, including (without limitation) public liability insurance for the goods being handled by any Equipment, to such an amount as McLeod considers appropriate in the circumstances. 16.2 During the course of the hire, the Customer shall not do, or omit to do, anything that may allow the insurance cover referred to in Clause 16.1 or claims under that insurance cover to be void, cancelled or refused or whereby the premiums thereon may be increased. 17.1 The Customer shall be responsible for the day to day maintenance of a Crane where such Crane is in the possession of a Customer including, without limitation, the supply of fuel for the operation of the Crane. 18.1 McLeod shall not be liable for delay or failure to perform its obligations if the cause of the delay or failure is beyond its control. 18.2 Failure by McLeod to enforce any of the terms and conditions contained in this contract shall not be deemed to be a waiver of any of the rights or obligations McLeod has under this contract. 18.4 These Terms and Conditions replace all earlier agreements, conditions and warranties, whether oral or written, between the parties relating to the supply of the Equipment and Services. 18.5 These Terms and Conditions take precedence over any other conflicting terms and conditions. 19.1 This contract shall be governed and interpreted in accordance with the laws of New Zealand. The Customer shall observe and comply with the provisions or all Acts, regulations, bylaws and codes of practice in force during the period of hire in relation to the work on which the Equipment and Services is to be employed and in the manner of performance of that work and in relation to the Site and with all orders and directions lawfully given by any competent authority. Please download a copy of our Terms and Conditions of Trade here. Terms and Conditions of Trade are also available on the back of all written quotes, invoices, crane hire dockets and consignment notes.